If you’re looking for Infant Respiratory Distress Syndrome Practice Questions, then this is the right article for. As you will see below, we have listed many of them out for you to help you learn everything you need to know on the subject for Respiratory Therapy school. This study guide is loaded with helpful information that you definitely need to know for you Neonatal classes in school. So are you ready to get started? It stands for Infant Respiratory Distress Syndrome. It is breathing disorder that occurs in premature newborns caused by immature lungs and a lack of surfactant. 2. What is another name for IRDS? 3. What is the IRDS pathophysiology? Acute hypoxemia by infiltrates within alveoli. 4. When does IRDS occur? 5. What are the signs of IRDS? 6. What is the IRDS screening? Hospitalized in NICU, observed, and intervention if distress. 7. What is the etiology of IRDS? Lack of surfactant in lungs for alveoli expansion, surfactant produced late in fetal life (premature birth risk), and lack of surface area for proper gas exchange. 8. How can we diagnose IRDS? Blood gas studies, signs of distress, and radiographic chest films. 9. What is the treatment for IRDS? Carefully titrated supplemental oxygen, using mechanical ventilation and PEEP and drug therapy, aerosol infusion of an exogenous surfactant into the pulmonary tree through the endotracheal tube, like beractant or poractant alpha, is done once or twice in the first 48 hours. Other treatment includes ventilator support, fluid clearance, post-natal surfactant therapy, corticosteroids in extreme use ECMO (oxygenates the blood) and, that the earlier the use of treatment the better. 10. What is the prognosis of IRDS? Has improved with technology, but is potentially fatal, often predisposes premature infants to BPD. 11. How to prevent IRDS? Mother is injected with a corticosteroid 24 hours before delivery to mature surfactant synthesis system. Use cortisol in late gestation (cortisol increases late in pregnancy to promote maturation of type 1 and 2 cells and surfactant production) not much benefit after 34 weeks. 12. What are the signs of respiratory distress in an infant? Tachypnea (increased respiratory rate), retractions (intercostal, substernal, supra-clavicular), nasal flaring, grunting, diaphoresis (sweating), lethargy, pale or cyanotic skin and acute thoracic tissue texture changes. 13. What are the possible laboratory and studies for an infant with respiratory distress? A chest x-ray is usually the first step after clarifying the history and examining the infant. Arterial blood gas analysis is considered regardless of CXR, it clues to impending respiratory failure and more useful for triage than diagnosis. CBC with differential if there is an infection. Also, get a blood culture if there is perceived of infection. Echocardiogram. 14. What is the description of IRDS? Premature infants, leading cause of mortality, structural immaturity in the lungs, and insufficiency of surfactant production. Keep airways open by lowers surface tension in air sacs. It is made of DpPC. 16. What occurs in surfactant production? Type II cells make surfactant proteins which can combine with fatty acids, choline, glycerol and amino acids. Surfactant production begins at 23 weeks gestation, and birth before 37 weeks can result in infant respiratory distress syndrome. Contains what is usually natural in lungs like sinapultide, phospholipids, and a fatty acid. 18. What is the definition of NRDS? It stands for Neonatal respiratory distress syndrome, and is caused by inadequate surfactant levels. 19. What cell type produces surfactant? 20. What is the major component of surfactant? 21. What is the importance of surfactant? Surfactant decreases surface tension in the lung, preventing collapse of the alveolar air sacs after expiration. This decreases the work of breathing. Lack of surfactant causes collapse of air sacs and formation of hyaline membrane. 22. What are the clinical presentations of NRDS? Increasing respiratory effort after birth, tachypnea with use of accessory muscles and grunting; Hypoxemia with cyanosis; and, diffuse granularity of the lung on x-ray (ground glass appearance). 23. What is associated with NRDS? Prematurity: surfactant production begins at 28 weeks and reaches mature levels at 34 weeks; C-section delivery: due to lack of stress-induced steroid production steroids increase surfactant production; and, maternal diabetes: fetal insulin inhibits surfactant production. 24. How do we screen for fetal lung maturity? 25. What are the risk factors for respiratory distress syndrome (or hyaline membrane disease)? Prematurity, Caucasian, male, previous baby with RDS, perinatal asphyxia, perinatal infection, multiple gestations, infant of diabetic mother and patent ductus arteriosus. 26. What are the complications of IRDS? Hypoxemia increases the risk for persistence of PDA and necrotizing enterocolitis. Supplemental O2 increases the risk for free-radical injury to the retina (blindness) and lung (bronchopulmonary dysplasia). 27. What are the physical exam findings for IRDS? Tachypnea, grunting, nasal flaring, retractions, and cyanosis. 28. What are the risk factors for surfactant deficiency? Premature, multiple gestation, diabetic mother, patent ductus arteriosus, and white male. 29. What is the clinical course of IRDS? Respiratory distress begins a few hours after life gets worse for the first 3 days and then gets better by day 7. Treat with surfactant (artificial or natural). 30. What is the definition of HMD? Insufficient amount of pulmonary surfactant or depressed surfactant activity. 31. What does HMD cause? 32. Who is most at risk for HMD? 33. What is needed in the assessment for patients that have suspected HMD? Past medical history, general appearance, respiratory pattern and breath sounds. 34. What can be seen in the past medical history of an infant with HMD? Gestational age <38wks and low Apgar scores. 35. When do signs of HMD present? Within a few hours of birth. 36. What L:S ratio should you expect for an infant? 37. What will an infant’s general appearance with HMD be? 38. What type of respiratory pattern can be seen in HMD? Tachypnea and possible apnea, intercostal retractions, nasal flaring, and grunting. 39. What type of breath sounds can be heard in HMD? Bronchial or harsh, fine crackles/rales and expiratory grunting. 40. What diagnostic tests should be done for infants with HMD? 41. What can be seen on the chest x-ray of an infant with HMD? Increased opacity, ground glass appearance, and air bronchograms. 42. What can be seen on the ABG results of an infant with HMD? 43. What treatments should be given for patients with HMD? Correct hypoxemia, maintain the environment, surfactant replacement and MV with PEEP. 44. How can hypoxemia be corrected for these infants with HMD? Oxygen via an oxyhood or NC, CPAP (4-6 cmH2O) and maintain PaO2 50-80 torr and SpO2 89-90%. 45. When should surfactant be administered to patients with HMD? Immediately after birth in neonates <35 weeks or once IRDS has been diagnosed. 46. What types of surfactant can the for HMD? Calfactant/infasurf, Berfactant/Survanta, and Poractant alfa/Curosurf. 47. How should the surfactant be instilled? Into the trachea through a 5 Fr catheter placed into the Et tube. 48. How is surfactant administered? 4 portions and be given one at a time. 49. When can the catheter be removed when giving surfactant? After each administration of surfactant. 50. What is a must after surfactant is administered and for how long should it be done for? Manually ventilate the infant and observe for adverse reactions for 30 seconds. 51. What adverse reactions should be looked for after giving surfactant to an infant? 52. How can the distribution of surfactant increase? 53. What is the primary assessment of an infant with HMD? Past medical history: gestation age <38, low Apgar scores, onset present at birth or within a few hours after delivery, L:S ratio <2:1; appearance of chest: intercostal retractions; respiratory pattern: tachypnea and possible apnea; color: cyanosis; , breath sounds: bronchial or harsh, fine crackles/rales, expiratory grunting; physical appearance: nasal flaring, grunting; and, vital signs: increased HR, BP, QT. 54. What is seen in the chest x-ray for IRDS? 55. What is seen in the ABG for an infant with IRDS? 56. What is the treatment and management of IRDS? Correct hypoxemia, oxygen therapy via oxyhood or nasal cannula, CPAP between 4 and 6, maintain Pa02 between 50-80 torr and SpO2 89-90%. Maintain neutral thermal environmental, surfactant replacement therapy, administered immediately after birth in neonate <35 weeks or once IRDS has been diagnosed, instill directly into the trachea in 4 portions, then manually ventilate for 30 secs after each of the 4 doses. Mechanical ventilation with PEEP for ventilator failure. 57. What are the symptoms of respiratory distress? Tachypnea, grunting, nasal flaring, retractions and cyanosis. And that wraps up our study guide. 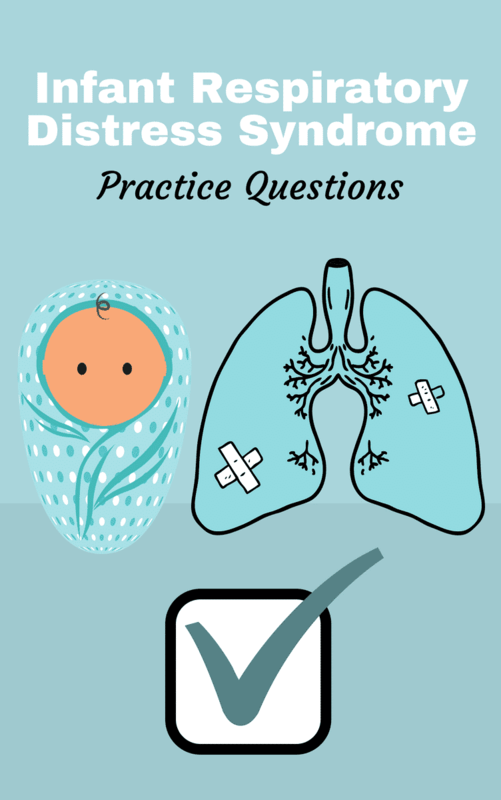 I truly hope that these Infant Respiratory Distress Syndrome practice questions were helpful for you. Make sure to go through these practice questions and answers again and again until the information sticks. Thanks for reading and as always, breathe easy my friend.